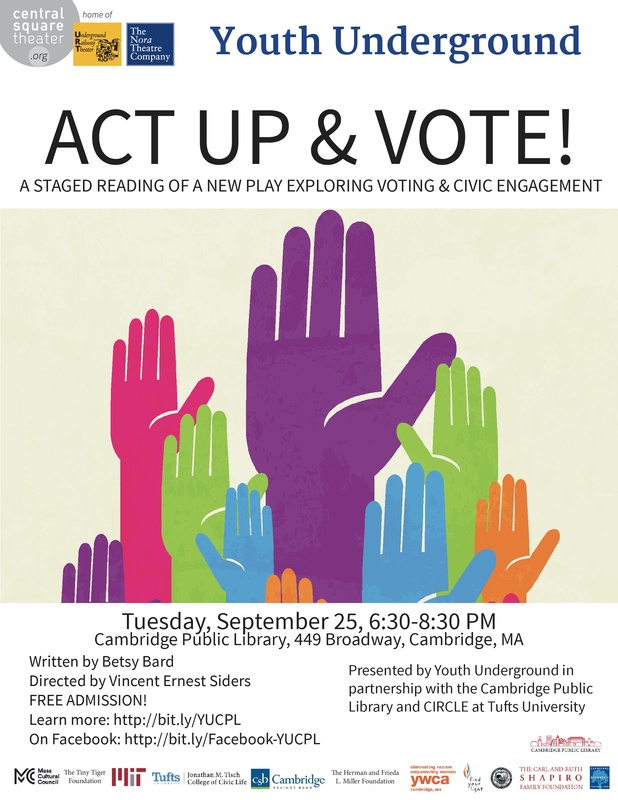 To celebrate National Voter Registration Day, actors from Central Square Theater will perform a staged reading of a new play, Act Up & Vote!, focused on voting and civic engagement and written by local playwright Betsy Bard. Following the performance, Peter De Guzman from CIRCLE at Tufts University will facilitate a talkback with the actors, creative team, and audience on salient themes in the performance and surrounding voting issues. Youth Underground is an ensemble that creates and performs original theater that investigates social issues relevant to young people. Our pieces are created through a series of interviews with the community. This summer our interviews centered around Voting and Civic Engagement, and Act Up & Vote! was born. Hear the voices of urban youth in our community, as well as their families, teachers, political leaders, and personal heroes as they share stories from their lives, debate about whether their votes matter, and work to make a better world. Register to vote from 9:00am-6:00pm in the Front Entrance of the library!